Product prices and availability are accurate as of 2019-04-15 07:59:35 UTC and are subject to change. Any price and availability information displayed on http://www.amazon.com/ at the time of purchase will apply to the purchase of this product. 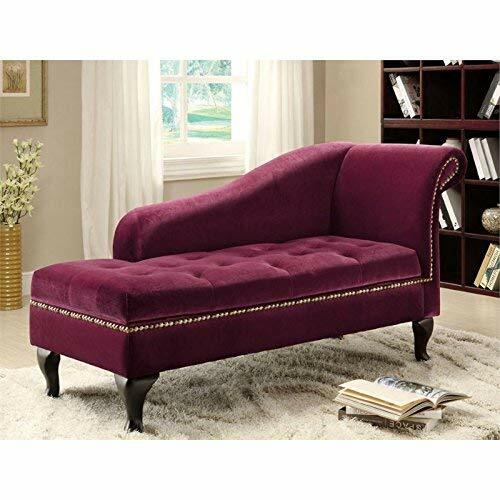 The Furniture of America Brandy Leatherette Chaise with Underseat Storage - Black adds a touch of opulent, vintage-inspired elegance to your home decor. Expertly crafted of solid hardwood upholstered in sleek black, faux leather ringed by metal studs, this laid-back chaise features a gently scrolled back and button-tufted, padded seat. A marriage of traditional style and modern functionality, this chaise is fitted with handily hidden, under-seat storage. Based in California, Furniture of America has spent more than 20 years establishing itself as a premier provider of fine home furnishings to urban-minded shoppers. The people behind the brand are moved by passion, hard work, and persistence, and their company's mission is to design the latest piece and offer high-quality furniture to trendy shoppers without compromising packaging integrity. Furniture of America offers unique, coordinated, and affordably designed furniture - not to mention exceptional style. Dimensions: 52L x 24.75W x 33.25H inches. Solid hardwood frame; faux leather with metal studs. Sturdy construction with deeply padded cushion. 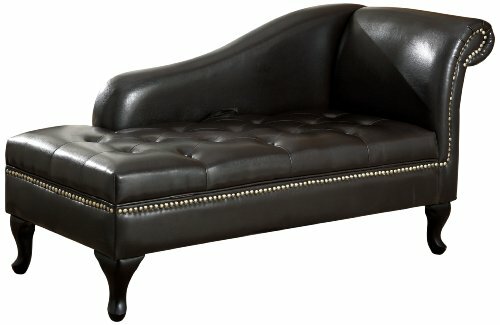 Sleek, black fabric with button-tufted seat. Marriage of vintage style and chic, modern lines. Fitted with hidden, under-seat storage.